NDLEA nabs 42 drug trafficking suspects – Royal Times of Nigeria. The National Drug Law Enforcement Agency (NDLEA) arrested 42 suspected drug traffickers between July 2016 and June 2017 in Nasarawa state. The State Commander of the Agency, Mr Ethan Sumaila, said on Tuesday in Lafia, that 700 kilogrammes of illicit drug, mainly cannabis sativa and Indian hemp, were seized. At a briefing as part of activities to mark the 2017 United Nations International Day Against Drug Abuse and Illicit Trafficking, he said that 39 of the traffickers were convicted, while three cases were on-going at the High court in Lafia. “We also rehabilitated 171 drug users within the period through the aggressive counseling programme of the agency. “Most of those rehabilitated were arrested by the agency, while some were voluntarily brought in by their guardians. “Currently, we have two young men in our facility who were brought in by their parents,’’ and said that counselling and rehabilitation remained the best remedy, given the low rate of relapse. He said that cases rate of drug trafficking dipped within the period and attributed situation to the high rate of convictions. 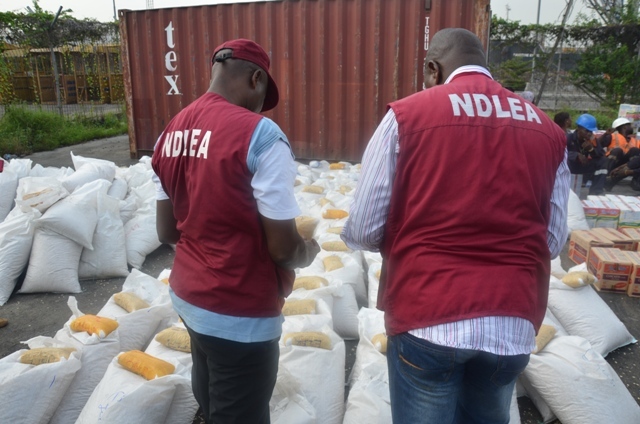 “NDLEA’s efforts towards eradicating the scourge of drug trafficking and abuse have been effective, but we shall not relent until the menace is reduced to the barest minimum,” he said. Also the Zamfara Command has attributed the rising crime rate in the state to increase in drugs abuse among youths, children and women. “The rising crime rate in Zamfara is closely related to drug abuse by youths, children and women. “Once we can check drug abuse, the society will be a better place for all of us,” its Commander, Mr Adamu Eigege, said in Gusau, at the display of some of the illicit drugs seized by the command. He listed some of the crimes to include cattle rustling, banditary, armed robbery, kidnapping and prostitution. Most of criminals, he said, rely on drugs “for boldness and courage” to commit crimes. He described the increase in drug abuse among women and children as “worrisome and unfortunate”.